Cooan is the youngest of the sisters (oldest in the dub) with the attack called "Dark Fire" ("Ice Fire" in the dub), and represents a counterpart of Rei Hino. Her name is short for kouankou, the Japanese word for kermesite. In the manga, Cooan tells Rubeus she feels someone like her that is kindred to fire and could be convinced to join the Black Moon. Rubeus gives her "Code001, Operation Re-cruit" to convert humans to their cause. She poses as a student named Kurozaki Cooan at the T*A Girl's Academy where Rei Hino attends and becomes the leader of a paranormal club called the Black Moon. The leader of the other supernatural club on campus is disturbed by how cold her hands and eyes are, and a black saucer-shaped object flies away after she leaves. Rei later has a nightmare about Cooan using her powers to burn the body of a child. At the school's culture festival, she sets up a booth telling fortunes of how and when her clients will die, but when Rei appears, tells her that everyone must die, but those who follow the Black Moon will die better. After Rei uncovers droids disguised as nuns, she transforms into Sailor Mars and defeats them, at which point Cooan reveals herself. In the ensuing battle, she blasts Sailor Mars with fire, and, in retaliation, Sailor Moon and Tuxedo Mask kill her using the Cutie Moon Rod. Mars, who was still stuck in Cooan's flames, is then abducted by Rubeus. In the anime, Cooan is, like all of her sisters, very vain about her appearance to the point of swearing death upon anyone who smudges her make-up or ruins her hair, and she relies on her charms to get what she wants. She believes that she and Rubeus are in a relationship, and competes with her sisters for his love. However, upon getting him a gift of cologne, he cruelly crushes it in front of her and tells her that her next mission will be her last if she fails him. 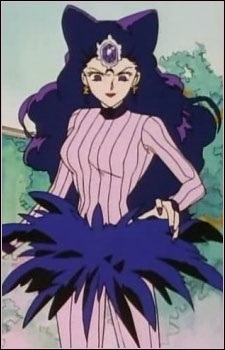 While trying to survey the Hikawa Shrine for the appearance of Chibiusa, she appears condescending of the relationship Rei and Yuuichiro possess and often compares them unfavorably to her perceived strong relationship with Rubeus. She later gets caught up in a discussion with Rei and Usagi, when Rei claims that the most important thing in a relationship is you believe in and love the other person, and Koan disagrees, claiming it only matters how much the other persons loves you. Her beliefs are put to the test when Chibiusa finally arrives and Cooan goes to kill her. Yuuichiro and Rei (as Sailor Mars) both get seriously hurt trying to protect each other, which surprises Cooan because of how she had perceived the two of them before. She ultimately fails to kill Chibiusa, and Rubeus appears to evaluate her. She begs him for his help, believing their love will be enough, but he tells her he has no use for her anymore and that he never loved her. He gives her a time-bomb and tells her to kill herself and the Sailor Senshi, and then abandons her. Before she can use it, the other Sailor Senshi arrive and knock the bomb away from her where it explodes harmlessly in the sky. Cooan finally starts attacking everyone in a blind rage, believing she has nowhere left to go, but Sailor Mars, after getting hurt protecting Cooan from the other Senshi, convinces her that she can have a second chance. Sailor Moon then purifies her with the Silver Crystal and she becomes a normal human woman. She later talks her next oldest sister, Berthier, out of killing herself and the other Senshi after she too is tossed away by her sisters and Rubeus, and later convinces Petz and Calaveras that they too are being used.